This is Comic Store Heroes, a wild and wacky adventure into the subculture of comic book super fans, where dreams are everything… and with a bit of faith and spandex, they really can come true. Amid the dark and dangerous shadows of New York, the real life Gotham City, shines a bright light that lures comic fans from every corner: America’s largest comic store, Midtown Comics. While dealing with eccentric super fans, daily battles for geekdom supremacy, men dressed as bananas, and one million customers a year, boss Gerry is also preparing for the biggest day of his comic year – New York Comic Con. And it’s just six weeks away! So he’s put his main men, Thor “The Marketeer” and Alex “The Negotiator” on the case. Thor has to track down a comic celebrity to appear at the store’s Comic Con booth, while Alex has to buy 10,000 old comics from super-collectors to then sell at the Con as well as completing a personal mission for his boss: finding Gerry’s elusive holy grail comic, “Hot Stuff, The Little Devil No.1″. This was the first comic Gerry ever read as a kid, and without it Midtown Comics wouldn’t exist. As an incentive, Gerry has offered Alex a cash bonus if he finds it. But it’s gonna be a hell of a challenge – it’s one of the rarest comics in the world! Comic Store Heroes, premiered Friday, July 13th at 8P et/pt. 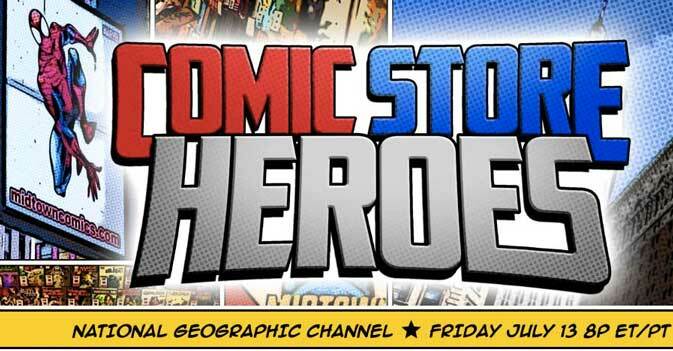 Right now, National Geographic is only supporting the pilot episode of Comic Store Heroes, and hasn’t announced plans for a full series. Previous Previous post: A refreshing look at climate change in America – what are we doing about it?